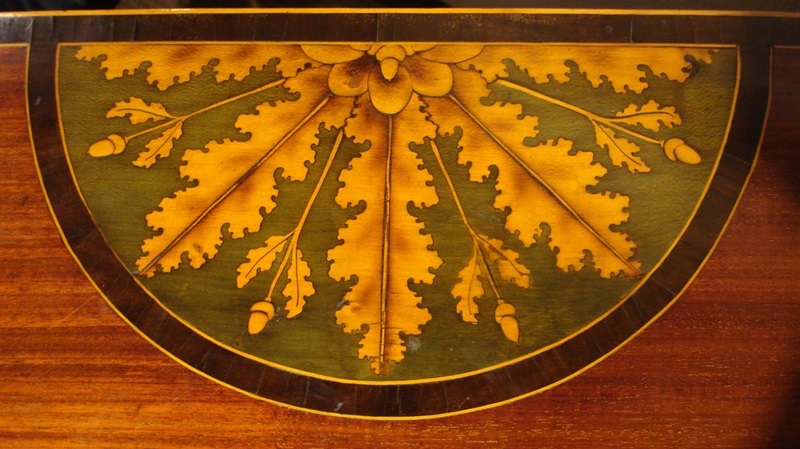 After reading my article in a 2003 issue of Antiques and Fine Art magazine about how the lily-of -the-valley inlay paterea is made; a collector in California contacted me about working on his Baltimore table. 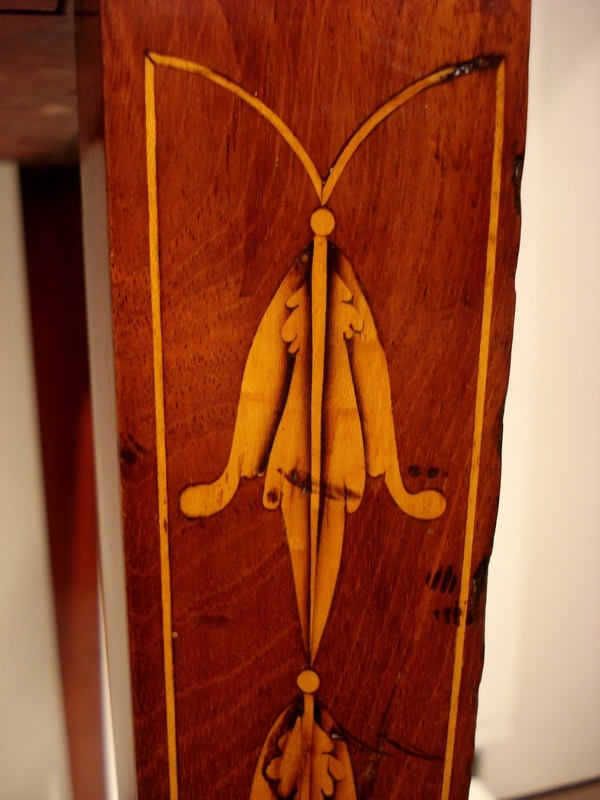 The mahogany table had the lily paterea at the tops of each leg. 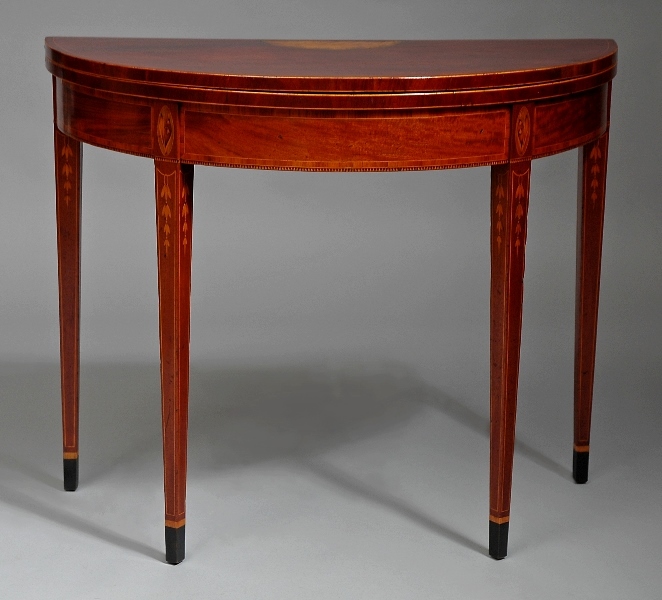 These were in good condition but a shell inlay in the top had been very poorly repaired before the purchase. (Fig. 1) Only three-quarters of the original material remained intact. The table was shipped to me for restoration. Thus began my research and study of similar Baltimore tables. 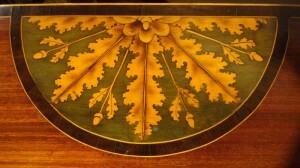 The lily-of-the-valley paterea were usually made from a single piece of holly veneer. (Fig. 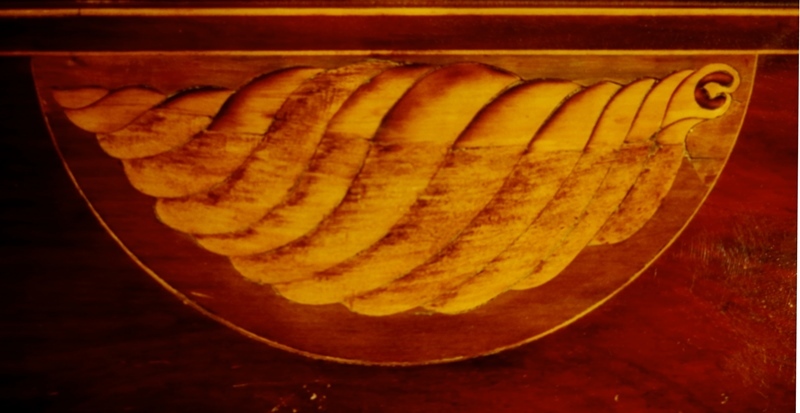 3) The pattern was cut out with a jeweler’s fret saw. 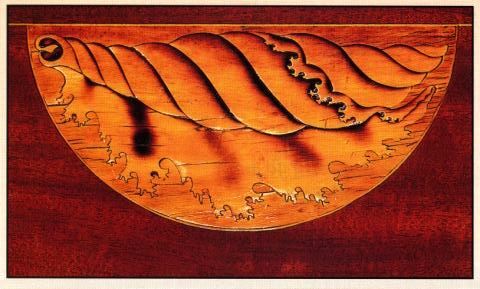 Some of the individual pieces were scorched in hot sand which darken specific areas to simulate shadowing and to create a three dimensional effect. The background was usually dyed green. Textile dyes can produce a range of greens. A mordant can be used to create an olive green. I frequently use iron acetate for an olive green. It is made by dissolving steel wool in apple cider vinegar. 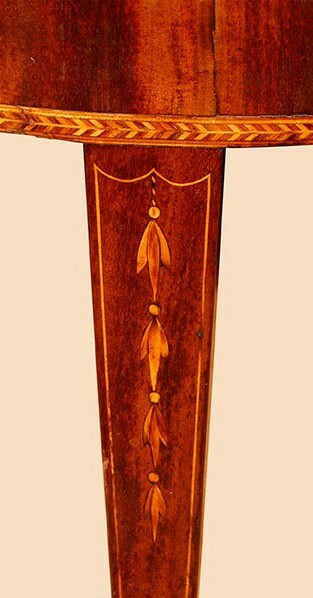 These colors typically fade on antiques over time; some were quite vibrant when they were new. 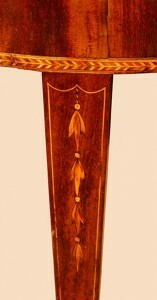 The paterea was often outlined with a single string inlay. 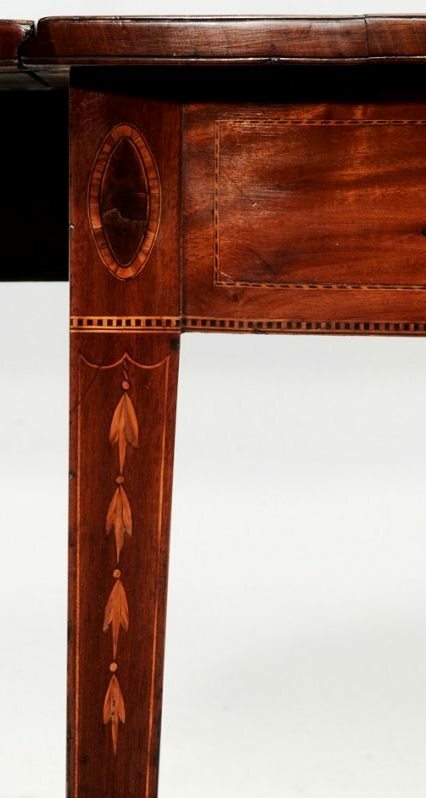 Straight string inlay lines outline the legs below the skirt and extended to just above the cuffs, spade feet, or brass cup casters. Undulating curved stringing was sometimes utilized as a decorative element within this stringing. (Fig. 4) Single and multiple bell flower husks were also used in this space. They ranged from a single husk to graduated descending husks divided by small inlaid dots or lozenges. Some were simple shapes that had basic incising to mimic veining. Others were more complex and could have three or five parts. (Fig. 5) Imaginative devices were often used at the tops as visual support for the husks. 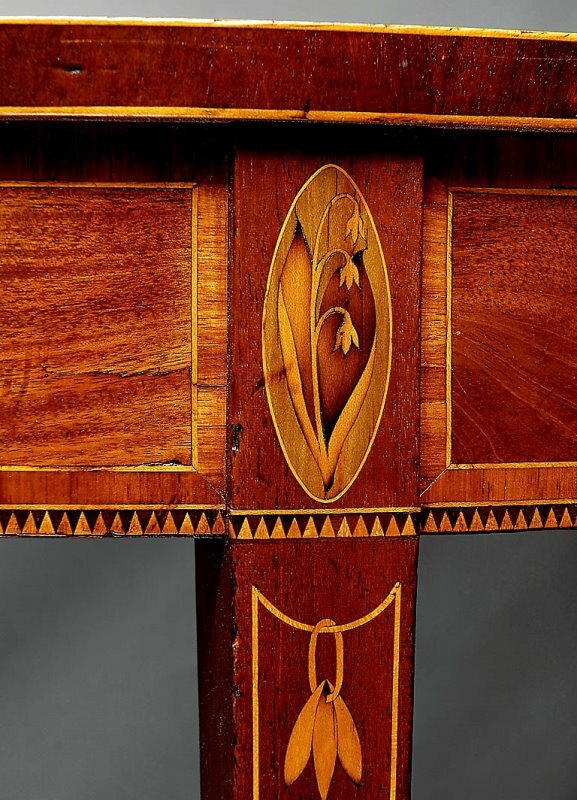 Solid veneer half-rounds, shells, fans, and floral inlays were centered at the rear edge of the tops of many tables. (Fig. 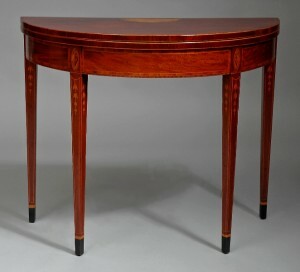 8) Restoring the damaged shell on this table was a challenging project. The entire panel was removed and the original holly pieces were separated. 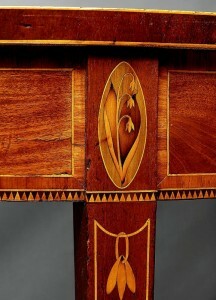 A study of other tables with shells indicated that the design was altered during the previous repairs. (Fig. 9) Both the reticulated outer edge and segment of the shell were lost as was most of the olive green background. Matching the quality of the wood and the aged light straw color of the original material is definitely the hardest part of restoring inlay. 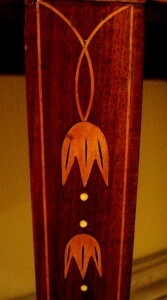 Often; the transition to the replacement pieces can be worked into the design. That was not the case on this project. The new parts had to merge with the old ones. I was able to find some high quality wood but new holly is almost white. 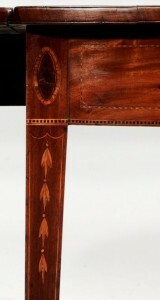 One question that I may never answer about antique furniture: How white was the inlay when the pieces were new? My solution to mellow the white wood came from dyes used for textiles. Onion skins! The skins were steeped in hot water and strained. This “tea” was put in a stainless steel bowl, along with the white holly veneer, inside a pressure cooker and “cooked” for 20-30 minutes. 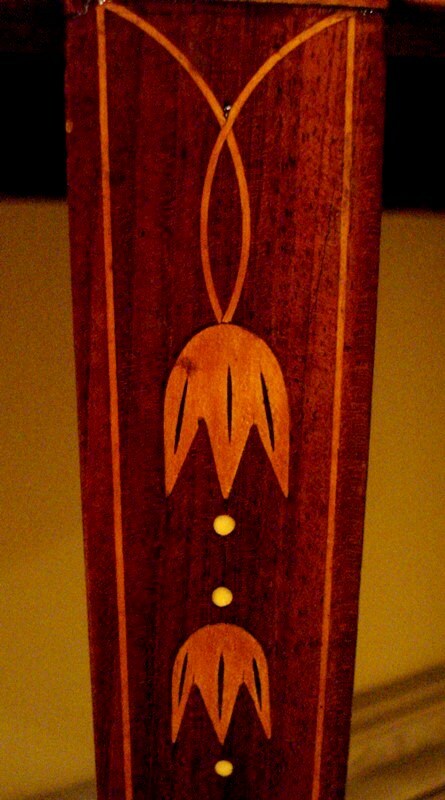 The pressure infused the dye deep into the wood and produces a clean even color. Although it was challenging; this table was one of my favorite projects. The owner was pleased with restoration when the repairs to the shell were barely perceptible.